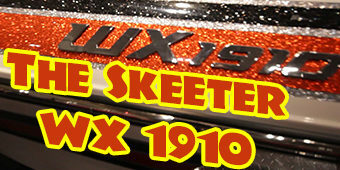 The Skeeter WX 1910 is a fishing machine! The hull is specially designed to work with the Yamaha F200 engine and has the REACT keel will help boat control in tight turns and at trolling speeds. There is no wood in the boat and the torque transfer systems eliminates transom cracking, this boat is designed to last forever! And with giant rod and storage lockers that have the Dry Dock system, your gear will last just as long!